On Thursday the 22nd May the EMEA #vBrownbag which I co-host weekly, ran a VCDX Special with Rene Van Den Bedem (VCDX 133) , Craig Kilborn , Bobby Stampfle and I. The special was an expansion of the London VMUG lightning talk that both Craig and I did on the 15th of May. The #vBrownbag session was recorded (after some early audio problems which meant we had to restart it) and the recording of the session is embedded below. The session proved a major success and we may run another one as the amount of questions we received during and have been receiving post the session is really positive. 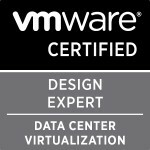 Categories: Certifications, EMEA vBrownbag, vBrownbag, VCAP, VCDX, Virtualisation, VMware | Tags: vBrownbag, VCDX, Virtualisation, virtualization, VMware | Permalink.